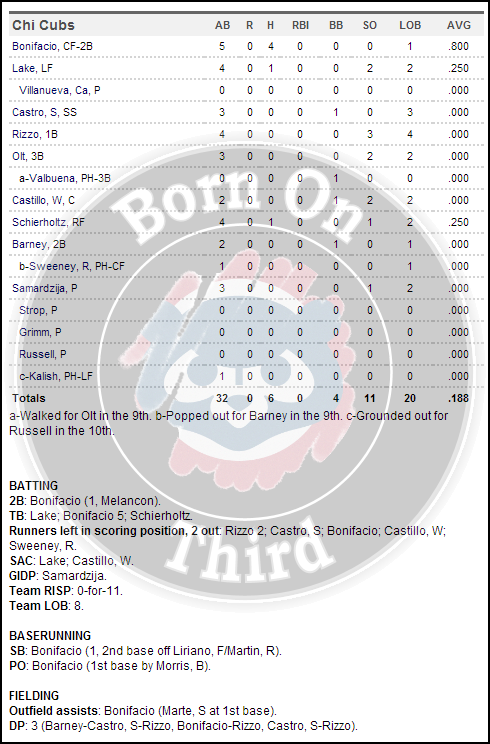 The Cubs did some good things today, getting hits with runners in scoring position was not one of them. But about those good things, the Cubs pitching was stellar, and their defense was just as good. Jeff Samardzija loves facing the Pirates, especially in Pittsburgh, one year after going eight scoreless against the Buccos, he went seven scoreless but settled for a no decision. Pedro Strop, Justin Grimm, and James Russell all did their job out of the bullpen, Carlos Villanueva, not so much. Villanueva faced one batter, and that was it, Neil Walker blasted a walk-off home run to move the Cubs to 0-1 on the young season. The Cubs struggles were front and center at the plate as they went 0-for-11 with runners in scoring position, yikes. They also struck out a lot, eleven times to be exact as they were baffled by Francisco Liriano all day long. I did like the Cubs approach today though, as they worked deep counts and were able to get to the Pirates pen by the 7th inning, it just didn’t work out. Emilio Bonifacio had a big day at the plate in his debut as he went 4-for-5 with a double, the Cubs as a whole only had six hits in the loss. Opening Day is upon us, one of my most favorite days of the year. 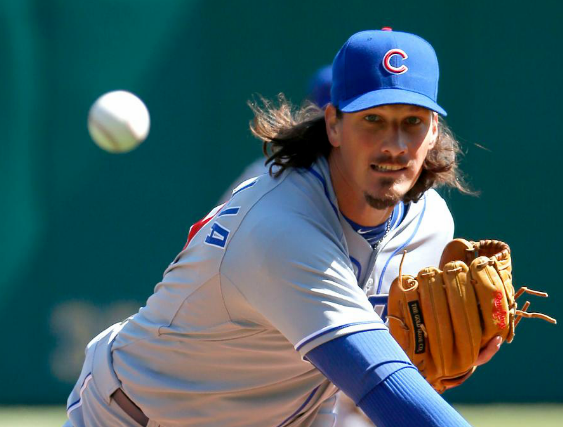 Jeff Samardzija, who owns the Pirates will take on Francisco Liriano, who owns the Cubs, something’s gotta give, or the bullpens will decide it. Below are the lineups, first pitch is at 12:05 PM CST, and the game is on ESPN (outside of Chicago), and WGN TV. 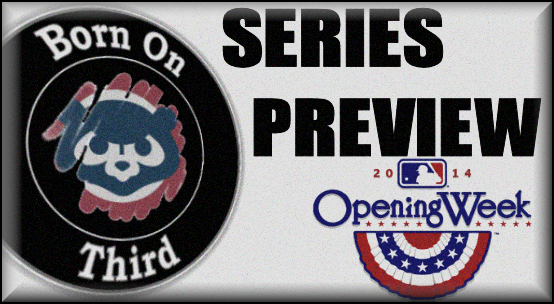 Author bornonthirdcubsPosted on March 31, 2014 March 31, 2014 Categories 2014 SeasonTags Chicago Cubs Opening Day Lineup, Pittsburgh Pirates Opening Day lineupLeave a comment on Opening Day Lineups! 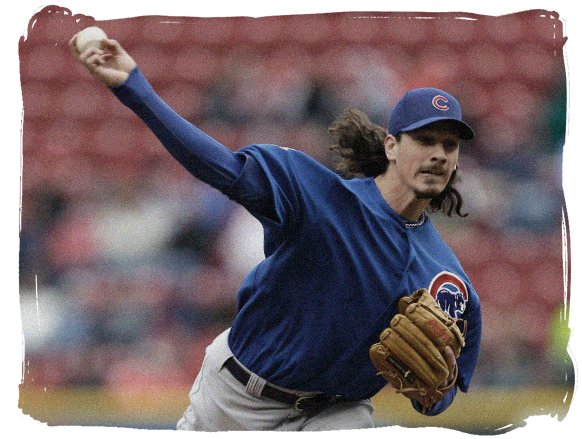 The Cubs ninth inning today was, well, not worth talking about. However, there were some good things that happened today, see below! Another night, another absolute BOMB from Javier Baez… wow.